On this last trip to Japan, M and I managed to hit 16 cities in a little over 3 weeks. This means that we spent a lot of time on trains as we zipped all over the country. Because we live in California where traveling by train is not common (I’ve taken the Amtrak once in my whole life), we really enjoyed our travel via rail: the speed, the convenience, getting to ride on so many different kinds of trains, all the wonderful scenery, and, of course, the FOOD! And by food, I am referring to bentos, those wonderful boxed lunches that contain all sorts of Japanese culinary delights. Go to any major train station in Japan and you are sure to find a store or kiosk selling bentos for all the hungry commuters that pass through daily. These are NOT ekiben. But yes, they were still very good. 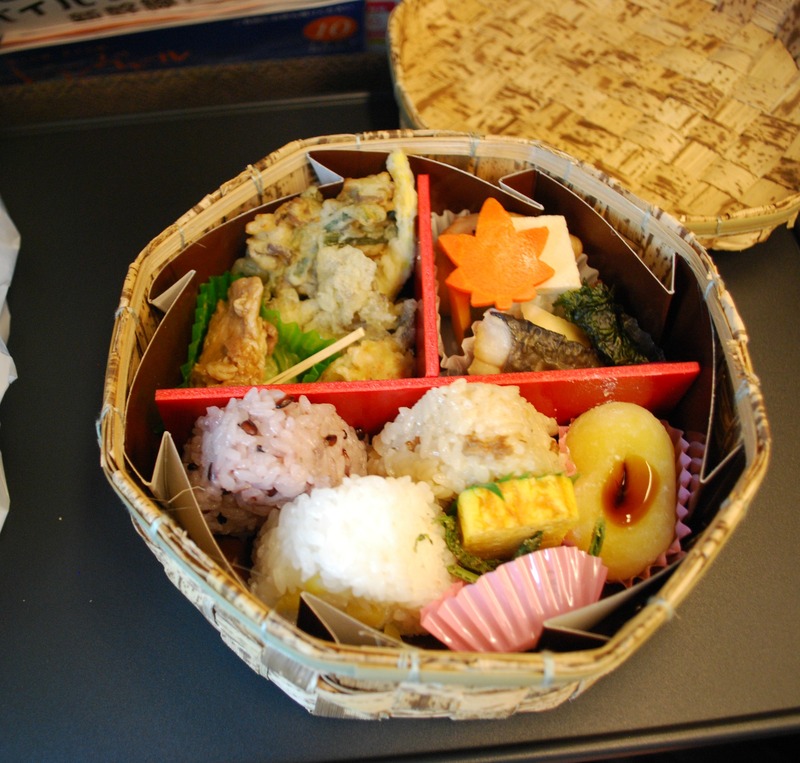 And then there’s the ekiben, which are bentos sold primarily at train stations and on long-distance trains. Unlike regular bentos which are fairly generic, ekibens take great pride in showcasing the cuisines for which that region is known. They are also more expensive than the standard bento and this price difference is reflected in not only the food, but the packaging and care with which the ekibens are put together. On this most recent trip, we picked up ekiben from 6 different cities: Sapporo, Tokyo, Nagasaki, Hiroshima, Sendai, and Kumamoto. I’m a bit sad that we missed getting one from some of the other cities we visited (Hakodate, Fukuoka, Osaka) but we’ll just have to leave that for a future trip! If you’ve ever been to Sapporo then it should come as no surprise that many of the ekiben were of the seafood variety. Ikura, in particular, is a very popular topping on seafood donburis and this ekiben had a decent sized portion of it. I was also very happy that there was crab included since we ran out of time to eat any while we were in the city. We picked up these two ekibens at Shinjuku Station to eat on the way to Hakone. We were in a bit of a hurry so we just grabbed the first couple we saw without putting much thought into what we were getting. (It also doesn’t help that our kanji reading skills are fairly terrible, so all the time in the world wouldn’t have affected our decision much anyways!) 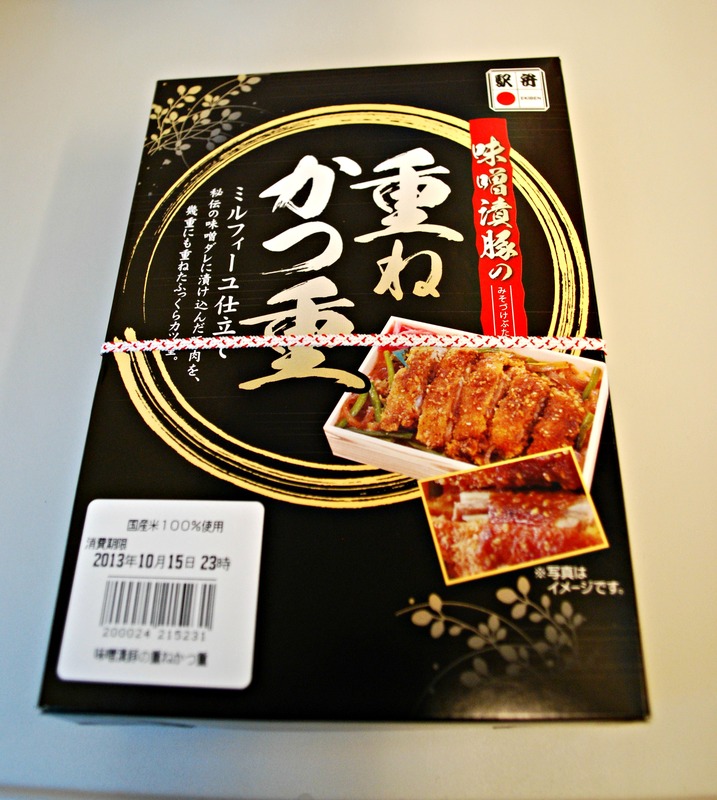 I was a little surprised when I opened the first box and found it to contain miso katsu which is actually a dish that Nagoya is famous for. But since we hadn’t gotten to eat any during our very short time in that city back in 2012, it was nice to get this second chance. Although tasty, it was unfortunately cold and I let M eat the majority of it. Very unfortunately, the second ekiben was also cold and quite a disappointment since I like sukiyaki very much. Not surprisingly, by the time we arrived in Hakone I was starving while M was sitting on a full stomach. Luckily, these were the only cold ekibens we ate during our entire trip. Oops, I left the plastic protector on the top half! The top half without the plastic protector. Is it any surprise that a Nagasaki ekiben would include a wedge of castella? Even though I’d eaten lots of castella by the time we got this ekiben, I was still glad to see my favorite dessert from that city. 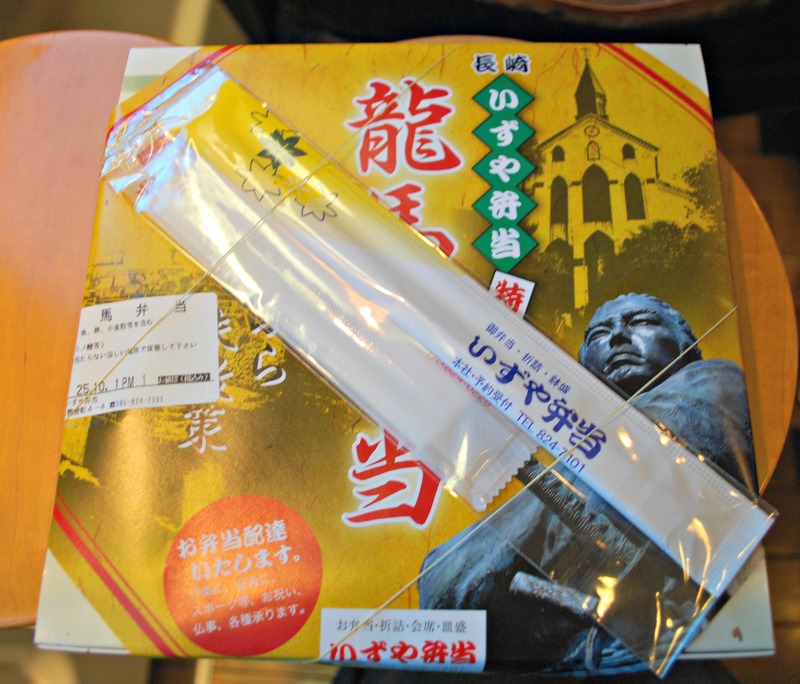 There was also a slice of kamaboko included which Nagasaki is famous for. I think M was a bit disappointed there was only one piece, he is quite the kamaboko lover. The first of the two Hiroshima ekibens really highlighted some of the seafood that the city is known for: oysters (the fried morsel on the left side of the box), conger eel (upper right corner), and octopus (upper left corner, there is a small piece of the rice). This was one of my favorite ekibens because I could really get a feel for the city while eating it. The second ekiben was a bit more standard but I did appreciate the musubis since the first ekiben was somewhat lacking in rice. Sendai is famous for their gyutan (beef tongue) and it didn’t seem right to get an ekiben that didn’t include it in one way or another. M pretty much ate that one while I had selected an ekiben that looked like it was catering to a female customer. I loved the packaging that the food came in, it resembled a basket, of sorts. Everything was arranged very prettily and it was delicious, to boot. This, I think, was the best-looking of all the ekibens we had during our trip. But to this day, I wonder if the little hunk of meat in the bottom row was from a horse (a Kumamoto specialty). One famous regional food that was included was the karashi renkon (the bright yellow ball in the upper left corner) which is lotus root filled with mustard. Wow, did that mustard give me a kick! I also really loved the manju in the bottom right corner. The transparent jelly was mochi-like in texture and the inside tasted like lemon, so good. They all look so mouthwatering! The last one is especially inviting!!! 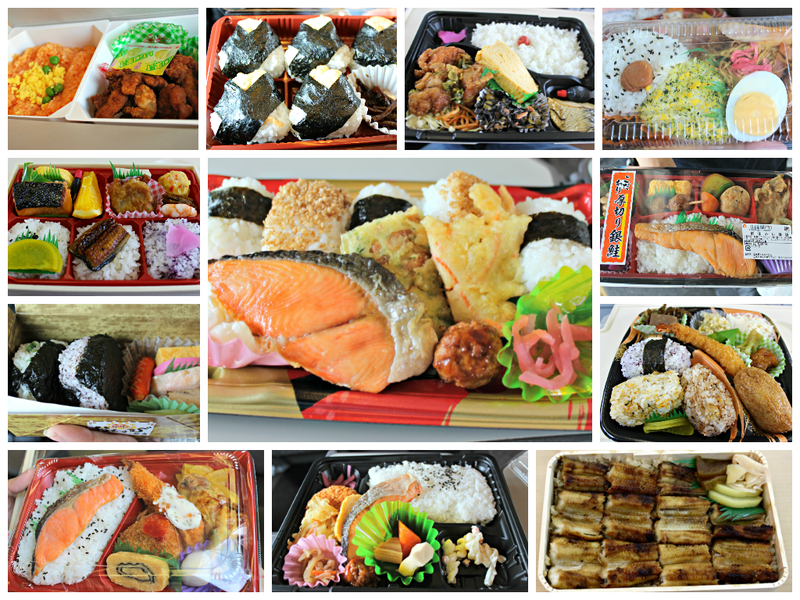 Yes, we had quite the “foody” adventure on our train rides throughout Japan. There’s something so fun about eating a delicious lunch that someone else packed for you while watching all the sights of the passing cities. The last ekiben featured on my post really was the tastiest and best-looking one. My only complaint about the ekibens is that there never seems to be enough rice. I always have to get a couple riceballs as a supplement. We do depend on rice pretty much, don’t we? It’s the most common staple food in most parts of Asia. Lol, maybe, I guess too much carbs is not a good thing. But being an Asian, I need my rice! I don’t eat nearly as much of it as I used to though. As I get older my metabolism can no longer burn off unlimited bowls of rice, so sad. Ooh, yum. So. Question. How do you know which trains sell these? Because obviously if the train doesn’t, we’ll need to stock up at the station. Oh! Followup question! I assume if the train sells food you can eat on the train, but otherwise? Also, are you pro-pin? Because I’m making a pinterest board on Japan and this is need-to-know. Oh yes, I am very pro-pin, I love Pinterest! I would be very happy if you could find any pictures from my blog to pin up. Ok thanks, I’ve just joined and not sure what the etiquette is. Since I didn’t see a pinterest share button I thought I’d better ask – I know of a couple of people who don’t like being pinned. In general, it’s only the lost-distance trains that sell them on board (such as shinkansens). For instance, the local trains that only travel within a city will not be selling them. Also, train stations from which long-distance trains do not originate will also, most likely, not be selling them. 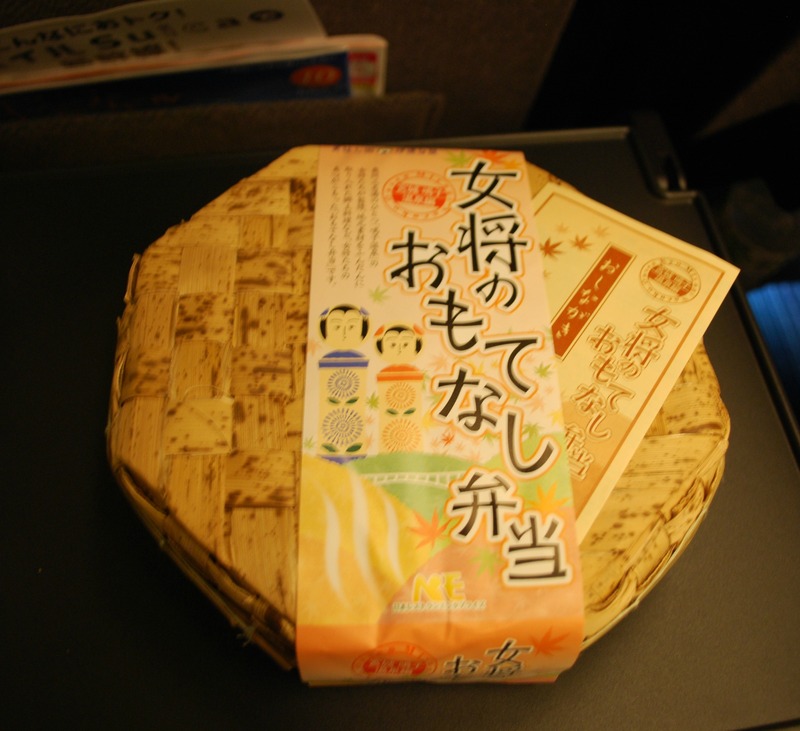 During our trips, we have never bought an ekiben on a train, always at the station before boarding. I think the trains do not have as good a selection and I believe they are more expensive. In case you’re wondering how to purchase them on a train, there is a worker pushing a cart down the aisle and they will stop and ask each passenger if they’d like anything. The cart has all kinds of snacks and drinks besides ekibens. We’ve sometimes had to purchase drinks but on other occasions we would get a free beverage because we were sitting in the Green Car. I don’t often see food being eaten on local trains, except for maybe small snacks. And even then, the person will try and be discrete about it. 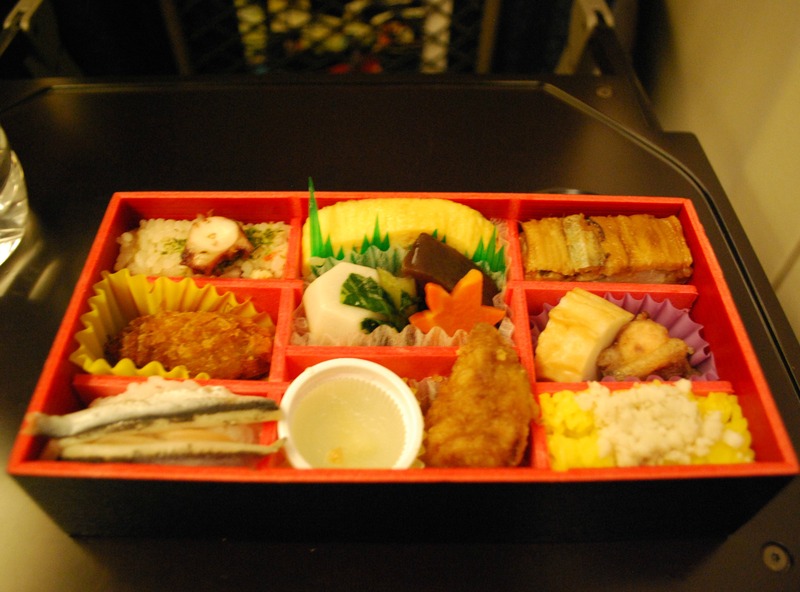 I’ve never seen anyone pull out a bento and eat it on a local line, that’s for sure! Ok, thanks for the detailed response! I guess what I’m picturing is being able to let the kids walk around at the train stations to stretch their legs and then feed them when they have to be sitting down anyway (on the train). 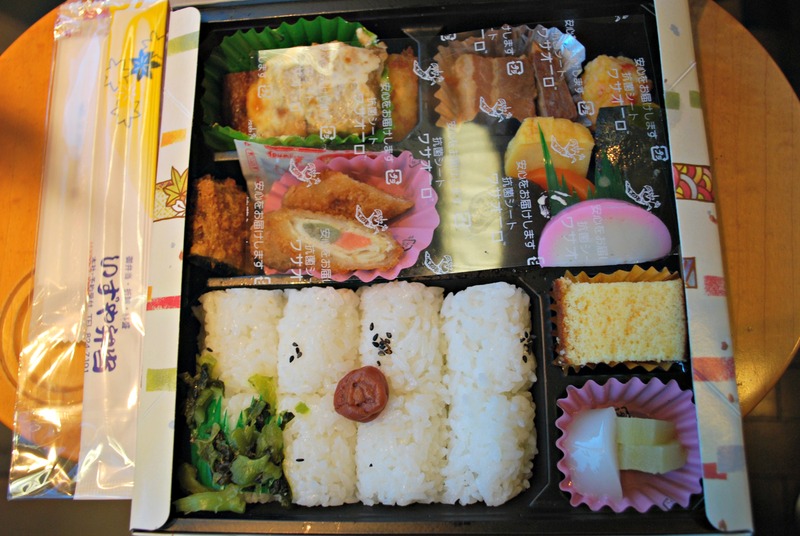 Given our train itinerary for the first day, it sounds like we might be looking more at a series of snacks than a bento, so I’ll bear that in mind when choosing snacks. We’ll definitely catch up with ekiben later in the trip on the bullet trains, though! 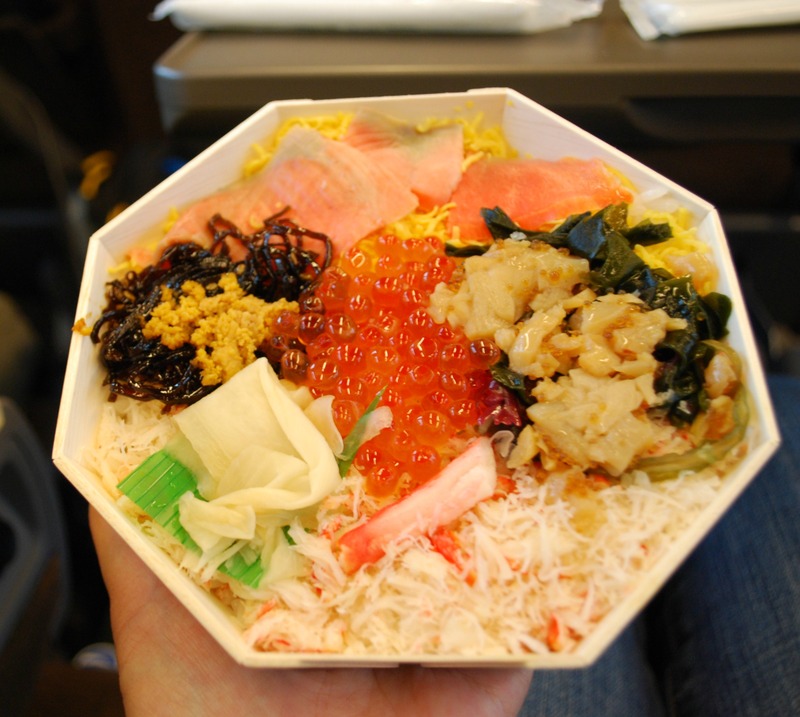 I asked a couple of friends (who go to Japan even more than I do) what they thought about eating on local commuter trains and they said it is pretty bad manners. They also told me there are signs advising people not to do it (even snacks), but I guess I didn’t notice them because my Japanese reading skills are so poor lol. When I protested and said I saw some people eating snacks they asked what age those people were. In thinking back, the majority were teenaged kids so maybe they were just trying to act out and be defiant. So, if it is a local commuter type train I wouldn’t recommend feeding your kids even small snacks. It’s probably best that they eat before or after getting on that kind of train. The ekibens were all packed so nicely. I was giddy opening each one to look at the contents inside. I’m glad I took pictures of all of them so I can use them as examples for when I pack a bento. Thanks so much commenting! That all looks so delicious. And really cute! I loved seeing the specialties from each of the cities. Definitely one of the best things about an ekiben is looking in the box for the foods that particular city is famous for. I think the Sapporo and Hiroshima ones really nailed that concept. I’d really love to try one from Kyoto someday, in pictures their’s look so lovely. Yes, they were all pretty tasty! Except for maybe the ones we bought in Tokyo but that was because they were cold. I wish they’d had a microwave on the train so I could’ve heated them up lol. Thanks so much for commenting! Yes, the ekiben were so good. Even though there are stores here in Southern Califrornia that sell bentos they are no where near as good as the ones you can find in Japan! 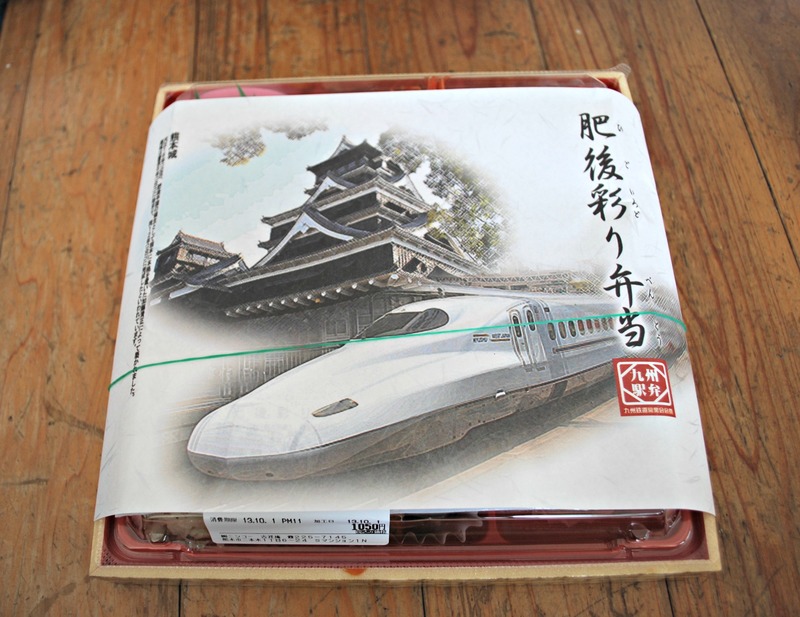 A great post about train travel and ekiben (train bento) from one of my wordpress friends. Thank you so much for reblogging this, I really appreciate it! Thanks so much for your kind words. Writing this post made me really miss Japan as well. 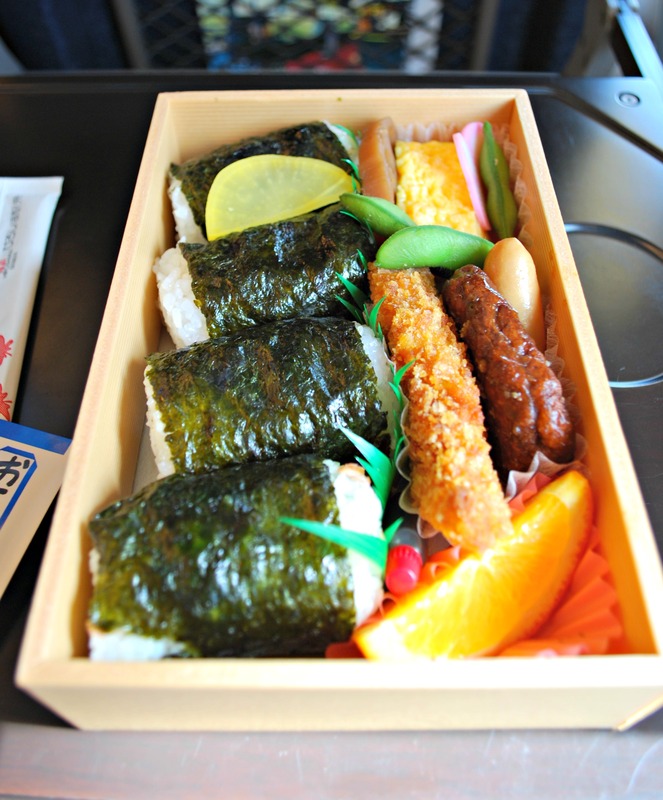 I have such fond memories of sitting on a train and watching the scenery whiz by while eating a delicious ekiben. It was only on this last trip that I really took the time to notice all the regional foods included in the ekibens. I’d really love to try the ones from Miyazaki and Wakayama someday since those are the regions my parents are from. Oh yes, very, very delicious! I shouldn’t have written this post in the middle of the night, I got so hungry and ate almost a whole bag of Ruffles chips. Really awesome post, about time someone highlighted train station bento. Probably way before your time, about a hundred years ago but still in my lifetime, when I was still in my late teens…young women would board the trains at one station with local bento in real lacquer boxes. The empty boxes would be picked up at the next station as another young woman boarded the train with bento from that region. Thanks so much for your kind words. I really enjoyed writing the post, it brought back great memories of traveling through Japan via rail. It’s fascinating to learn that the ekiben were once served in real lacquer boxes. I wish I could go back in time and be able to experience that just once! Food is something I always worry about when I think about my future travels to Japan. I’ve been wanting to visit and tour since I was about 12 years old (I’m 25), and someday when I’ve got the time and money, I’ll definitely make it happen. I’ve already got the passport, so at least that’s taken care of. But getting back to the food — I’m such a wuss when it comes to trying new food. As much as I love almost everything about Japan (from an outsider’s perspective), the food is the one thing I’m actually not so sure about. To be fair, I’ve had very little in the way of legitimate Japanese food. Considering our American, pseudo-Japanese steakhouses don’t count, the amount of authentic Japanese cuisine I’ve had is limited to things like sushi, gyoza, shuumai, tempura and ramen. Of those things, sushi is the one thing I really didn’t care for. The rest was great, but it was also relatively familiar (fried goodness and noodles/soup). When I see and read about all the things that make up true Japanese cuisine, I get really apprehensive about even the prospects of trying much of it, because I either don’t know what I’m looking at, or I don’t think I’ll have the courage to try the things I *do* recognize. I’m afraid that’s going to limit my dining options when I finally do make it over, and even worse, I’m afraid I’m going to offend someone or hurt their feelings if I try something and don’t like it. I totally understand your concern about food in Japan. Although I ate lots of Japanese food when growing up, I’m a fairly picky eater and there’s still much of the Japanese cuisine that I don’t care for. You did mention liking gyoza, shumai, tempura, and ramen and that’s really a great start. If you stick to the larger cities, there are so many places where you can find that stuff as well as other foods that most foreigners seem to find fairly easy to eat (gyudon/beef bowls, kushiage/deep fried kabobs, yakitori/skewered grilled chicken). I have a couple friends who are very picky eaters and they got by with combini food (riceballs, yakisoba, pastries, sandwiches). Maybe it’s not the healthiest way to go but this wasn’t a foodie trip for them, it was about seeing the country. Since you seem to be very considerate about making sure not to hurt anyone’s feelings, I would probably recommend that you not stay at a ryokan. The food there is of a more homemade/very traditional Japanese variety and you are oftentimes served in your room. The person serving you would be sure to notice if you left a lot of the food behind and that would probably be very uncomfortable. You have been wanting to go to Japan for a long time! I hope it happens for you soon. I think that you will have a fabulous time when you finally get over there. Even if you find some of the food not to your liking, the sightseeing will probably more than make up for it. The art of the packed lunch is something that Japan has clearly mastered to the extreme. Sometimes, the problem isn’t having too few options to choose from, but having too many. You can imagine the amount of time I waste in train stations just trying to decide which meal to buy for my trip. One thing that does rear its ugly head now and again is my seafood phobia. There are times when I’m on the point of picking up a bento and taking it to the cashier but then, on closer inspection of the sample model or picture, I find a piece of fish (or, worse, shrimp – which I’m mildly allergic to), in which case I have to let it go and find something else. On rare occasions, I’ve even had to make do with pastries or some other snack food because every single bento in the store contained seafood in one form or another. I certainly don’t blame them for using seafood given the important role it plays in Japanese cuisine, but it does make things difficult from time to time. I’m glad your tastes are far more open. I can see a lot of great-looking morsels in this post that I’ll probably never get to try (unless I’m travelling with family, in which case I can pick out the seafood and hand it over to my sister who loves the stuff). 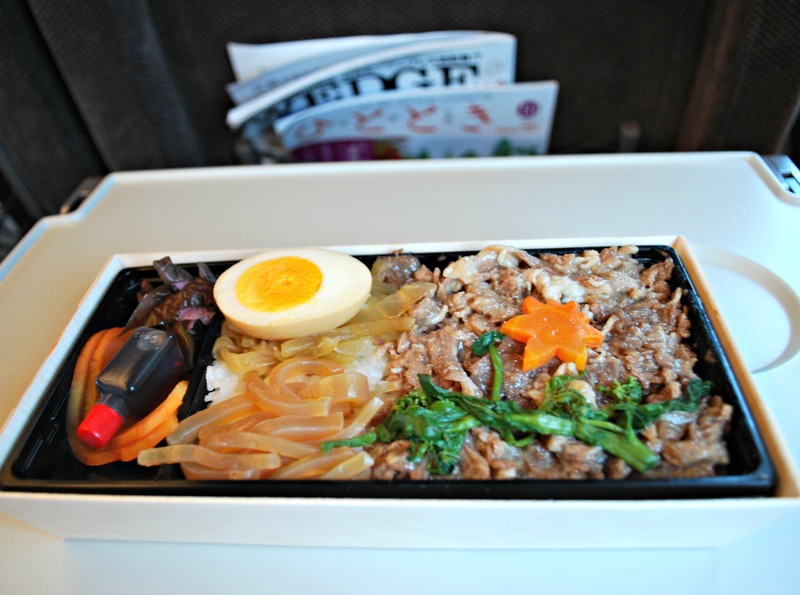 Oh, and that beef sukiyaki bento under the Tokyo section? 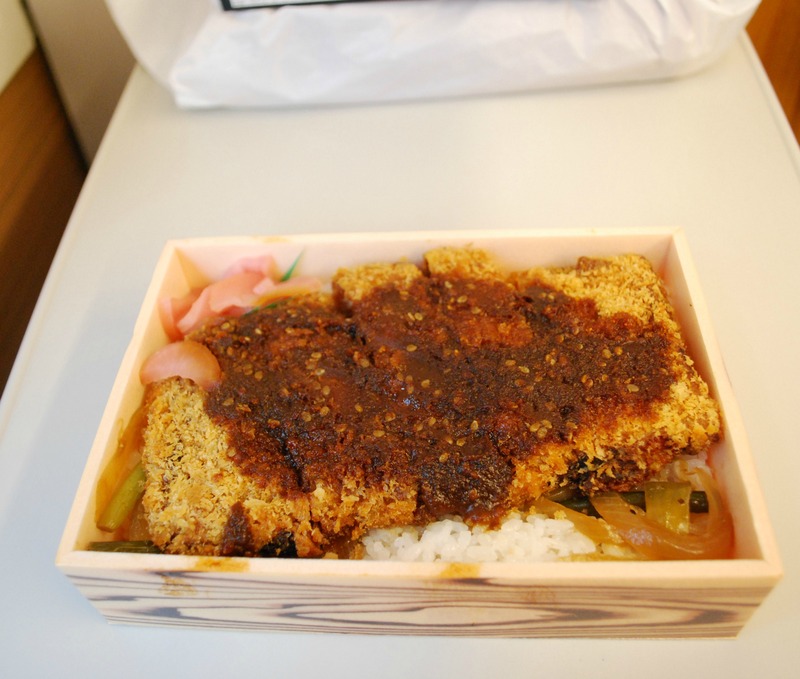 I do believe I bought the exact same meal last year – my fuel for a day trip to Sendai. That IS the same ekiben, how funny is that! I hope yours was not cold like ours was. In my opinion, sukiyaki is a bit of a strange choice for an ekiben because it really diminishes in quality as the temperature decreases. But maybe it’s just me…..M ate it without complaint and it must be a fairly popular choice since they were still selling it 6 months after you purchased yours. I am actually quite a picky eater. I don’t mention it in the post but M would always give me first crack at the ekibens and then eat all the leftovers that I didn’t want. Which sometimes amounted to more than 50% of the the ekiben. It’s kind of funny when you consider our backgrounds when growing up. Although we’re both Japanese-Americans, I am second generation (both my parents are from Japan) and he is third (his grandparents are from Japan). Thus, I was exposed to much more of the traditional Japanese cuisine than he was and yet his tastes are far more open than mine. Like you, there were instances when I couldn’t find an ekiben to my liking and I had to make do with a couple musubis or Yamazaki sandwiches. Not that I’m complaining, musubis, in particular, are one of my favorite things to eat. Yum!! 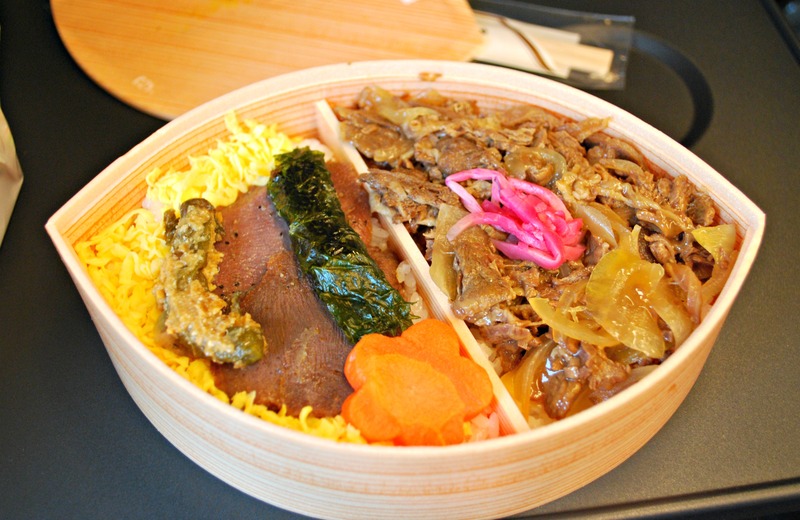 I’m planning a trip to Japan in April and cannot wait to try these ekiben boxes! Ohhh lucky! Even though it’s only been a few months since we came back from Japan, I’m ready to go again lol. I’m already looking forward to reports on your trip! I can safely say that our purchase of cheap combini bentos way outnumbers all the ekibens we’ve bought. Combini food is just awesome, I especially love the musubis and Yamazaki sandwiches, and various pastries! But one wonderful thing about ekibens is how well it shows off the regional cuisine. I very much hope you will get a chance to try one someday. I saved my money on eating at the destination cities, thinking that by comparison, Shinkansen food is the same … big mistake? Are there differences between the food onboard or are these variations exclusive to the stations? Shinkansens will pick up some ekibens at the stations they pass through. 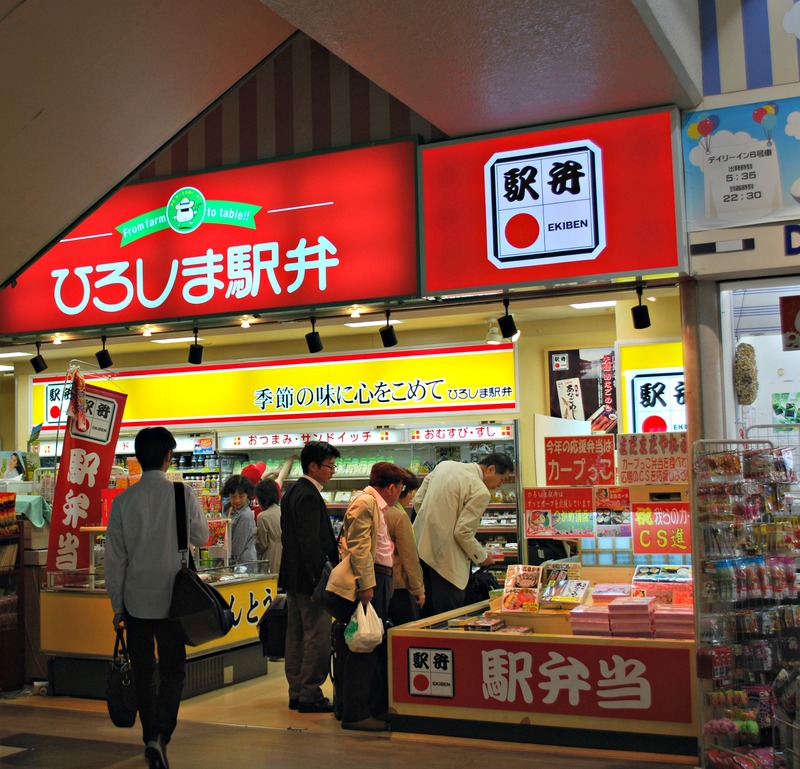 Because their selection is very limited (only a couple of different types of ekiben), it’s much better to purchase the ekiben at the station stores or even at the kiosks located on shinkansen platforms. 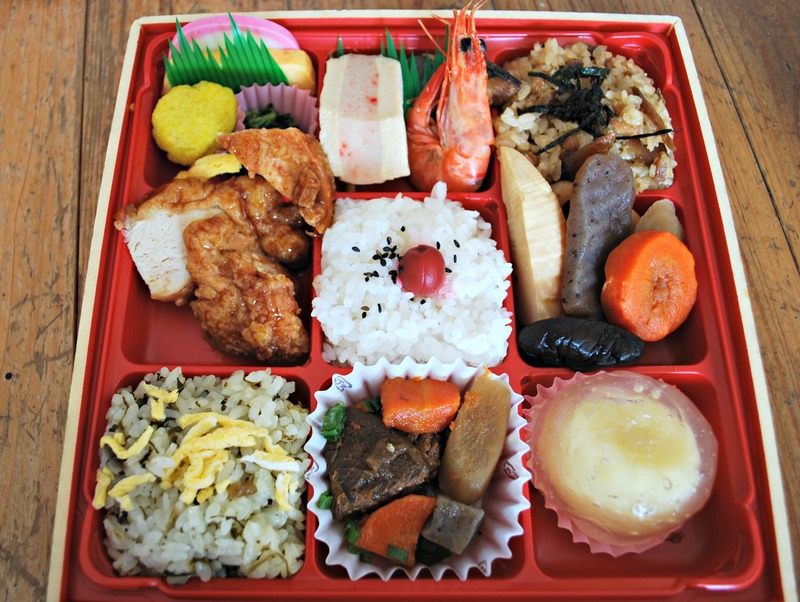 Ekiben are often unique to certain stations since a huge part of their appeal is that they use regional ingredients. 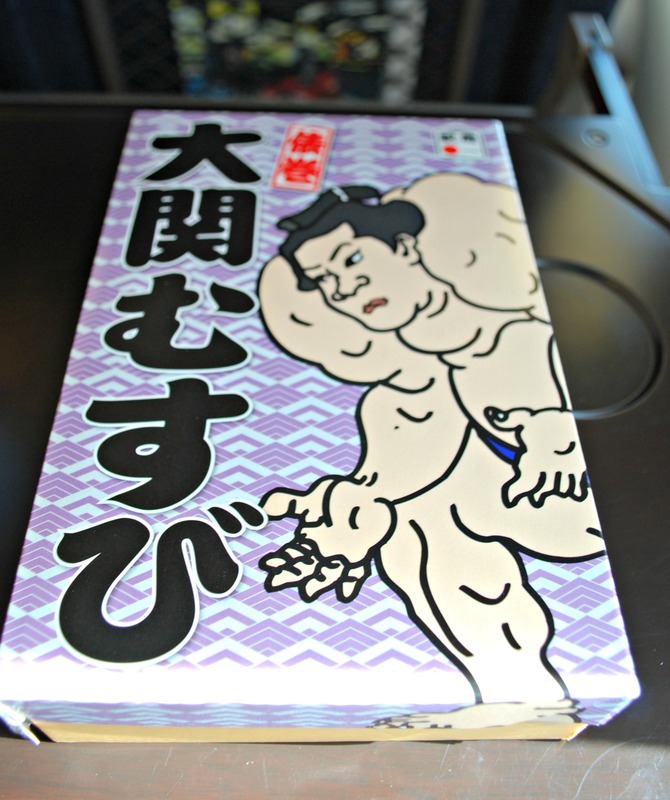 That being said, if all you ate was ekiben purchased on shinkansens that is by no means a mistake. 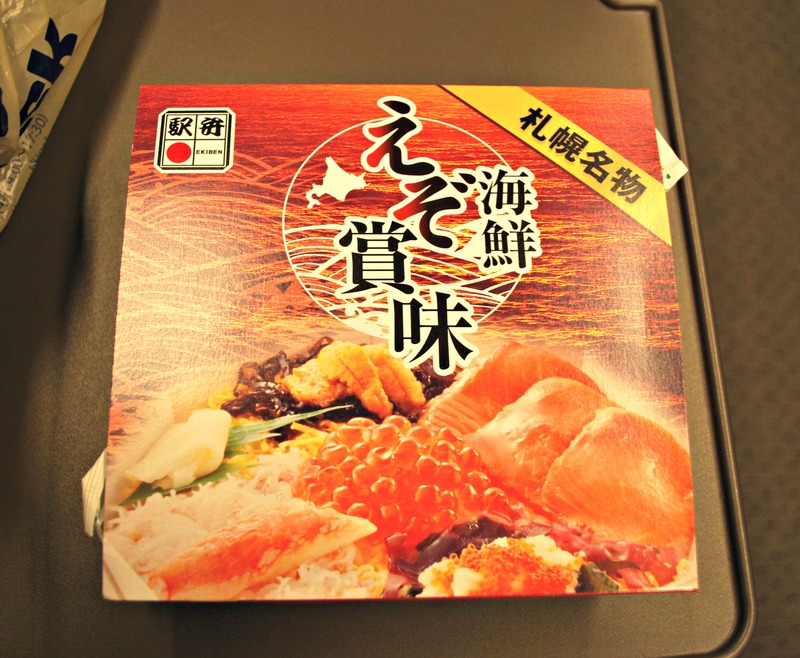 It’s still an ekiben even though you may not be able to necessarily pinpoint which station it came from. Wow. Love the packaging of those bento and the contents look great too! I loved the packaging too. I really hated throwing away some of those containers, it felt like such a waste. I actually know a couple people who visited Japan and brought back the fancier ekiben containers back with them to reuse. Some are even ceramic and others have drawers that pull out. Lovely ekiben! I especially like the Hiroshima ones. They all looked a lot better than what’s available on British trains…. The Hiroshima one was really wonderful in that it really worked the regional ingredients into the ekiben. I have only been on one train here in California but I think it only sold such stuff as cold sandwiches and dried up pizza. I would imagine the British trains must have better offerings than that! This post is making me so hungry now! I love taking trains in Japan, especially the long journeys because they’re special somehow. Ekiben is definitely one of the best parts (^o^) It always amazes me just how much detail is put into the boxes, from pretty packaging to the regional specialties. It’s so cute how the Nagasaki one has castella in it! Even with all the castella I gobbled up in Nagasaki I was so delighted when I saw that small piece in the ekiben. Not necessarily because I was craving any more castella but because it was so fitting. Riding the train in Japan is such a treat because I never ride any kind of public transportation here in So Cal (everyone has their own cars). Oh, I know, Kumamoto’s was definitely my favorite in terms of looks. Tastewise, I might have to lean towards the Sapporo one. The seafood from that area is incredible. Wow, all these bentos look really yummy! I’m so jealous! Not to mention your entire journey, 16 cities in more than 3 weeks, you are quite a planner. I wish we had bentos like that here in So Cal. There’s places that sell bentos but they’re more the standard variety, nothing like an ekiben. On our last 2 trips to Japan we really tried to cram in a lot of cities into a short amount of time because we had the JR Pass. But I think our future trips will concentrate on a much smaller area and we’ll go at a more relaxing pace. The boxes from Sendai are reaLLy pretty! OMG, 10 hours of layover, I don’t think I could take it! I’m sure anything would have tasted pretty good after being in transit for that amount of time. But an ekiben’s definitely not a bad choice. I have yet to try one from Osaka, it would be cute to find one with a takoyaki in it lol. I’m inspired to grab the misses and hop some trains when we go back to visit her folks. Any excuse to eat something different is good enough for her. Love the insane food culture of Japan. Thank you! I love riding the trains in Japan, it’s such a great way to see the country. And yes, it’s made much more enjoyable when you have an ekiben to eat along the way. Because of this, you’re encouraging me to learn how to cook Japanese cuisines! We have Japanese restaurants in the Philippines and I love it. The only Japanese restaurant I’ve been to, since I start living here is Kobe Steakhouse, and it’s pretty delicious! Kobe Steakhouse sure is a popular name for a Japanese restaurant! We have a restaurant called that less than a half hour away in Seal Beach, CA. And when we were in Orlando we also saw another restaurant with that same name. Is yours also a teppan place? I just love teppan, we usually go to Benihana because they always have really good deals for couples. Yup, it’s a teppan place and my husband was amazed when we got there! Yes, we ate all those ekibens on this last trip and a few more that I have forgot to include in the post! Because we had the JR Pass, we were on a train almost every day and we would usually buy an ekiben or bento before boarding. I am really looking forward to eating more from other Japanese cities on my next visit to Japan. Great Photos!!! That’s definitely interesting point of view!!! Ekibens remind you its culture and location. Thank you! Yes, one of the funnest parts of eating an ekiben is looking for the regional ingredients in it. I was really happy that the Kumamoto one had a karashi renkon in it. I don’t usually like renkon too much but it actually tasted very good. Looks amazing! I don’t mind being on the road just to taste all these! Yes, the ekibens make the train trips go so much faster. While we enjoyed the train rides for the most part because we got to see so many parts of Japan, it would get pretty tiring after the 2 hour mark. But an ekiben always helped us to feel refreshed and energetic again. Yeah, cold sukiyaki is really not very good. I know some ekibens have a built-in function that warms up the food and I’m surprised that one didn’t have it. Are you still going to Nagasaki during your Spring Break? Maybe you can get an ekiben during that time. 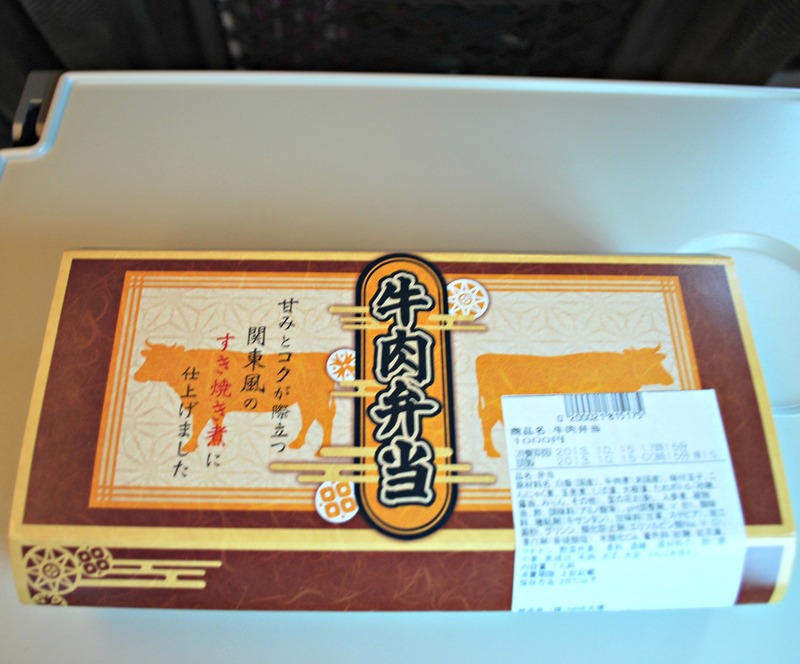 I really liked the ekiben I got from Nagasaki, especially the little piece of castella lol. Sorry for the late reply! I still want to go to Nagasaki this spring before term starts again but I’m feeling a bit poor after going to Malaysia! Haha, if I don’t go this spring I’ll see if I can go in may or August 🙂 if the Nagasaki ekiben has castella in it then I’m definitely going to buy it!! Oh, no worries, I’m sure you’re having a wonderful time in Malaysia! It’s so lucky that you get a whole month off for spring break, in America it’s only a week at most. But maybe the summer breaks are longer in the US? The Nagasaki ekiben with the castella in it was so cute. It’s always nice when the ekiben includes a dessert. Seems like you have picked up all the right Ekibens! They look awesome. Makes me want to go back to Japan right now and take a Shikansen trip just to eat these Ekibens. Haha. I think it’s pretty hard to pick a bad ekiben (well, that cold Tokyo sukiyaki one was not that great lol). Wow, really nice ekibens! I really like the Sapporo one just because if the ikura. Too bad about the cold one that you had. Horse meat sounds a little too exotic for me even though we eat what others would consider exotic as well. But it looks like that it (Kumamoto) was the most expensive one. Good to know that they are good and not like airline food. I’m impressed that the sauce for the sukiyaki came in a tiny plastic bottle and not just a sachet. Horse meat is pretty exotic sounding to me too. 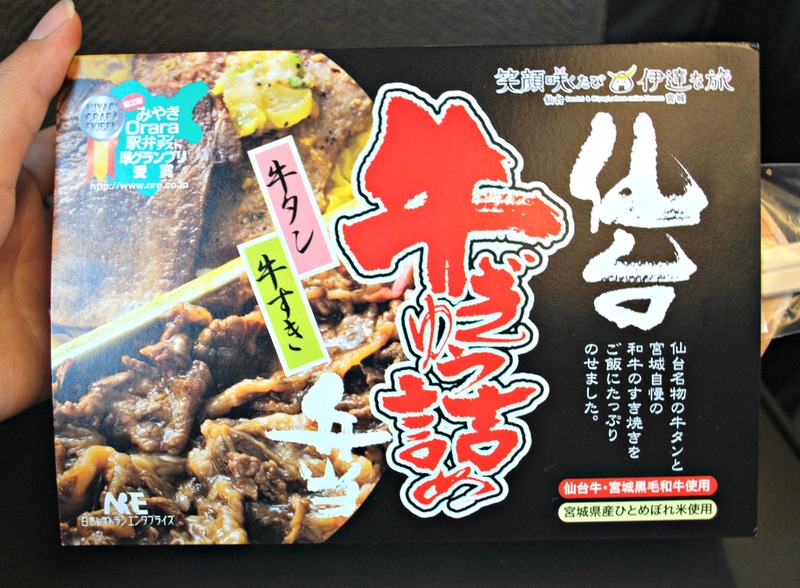 I think it was just beef in the ekiben though because that city usually eats its horse meat RAW! Yes, horse meat sashimi. Even though M’s aunt has told us of a very popular horse meat sashimi restaurant we should try while we were in Kumamoto we just couldn’t do it. I did, however, eat some horse jerky and that was OK, probably because it had lots of seasonings on it lol. Mmm, salmon sashimi, I just had some too! I actually eat lots of salmon because it’s one of the foods that helps to prevent my migraines. I like to make mine poke style. RAW horse meat?!? Ok, I know that some people probably love it but I can’t really get my head or my mouth into eating raw horse meat. I don’t even eat raw pork or beef. Yes, apparently the fatty acids in salmon helps prevent migraines. If I eat enough of it, I can totally keep the migraines at bay. But I get so sick of salmon after a while and I’ll quit eating it until another migraine pops up and then I have to go back on the regimen. I am sorry to hear that you also suffer from migraines even if it’s only once or twice a year. If I don’t eat the salmon, I get them several times a month. are there any vegetarian ones available? I’m sorry, I really don’t know the answer to that question. I know there’s over 2000 different types of ekiben throughout Japan so you’d think at least some would have to be vegetarian. But in my own travels I know I didn’t come across any. And even if it looks vegetarian, there’s always a chance that the vegetables were cooked in fish stock. Thank you! Yes, I heard that before about businessmen and their favorite ekibens. If I had to pick one I’d say the Sapporo ekiben was my favorite, the seafood up there is so phenomenal. Hi! How have you been? 🙂 The assortment of bento boxes you guys have tried is AMAZING to say the least. Such vibrant colours and so many different shapes and ingredients. It certainly stimulates my taste buds through it’s visual alone! Oooohhh I LOVE ekibens! I travel by train everyday but too bad I don’t have the luxury of riding such long rides for most of my time here (urgh, Japan, why don’t you guys ever take a break?!) 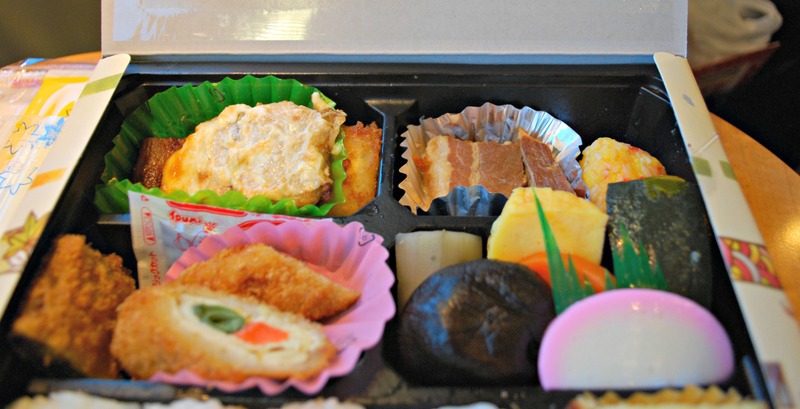 The ekiben from Nagasaki looks so pretty!! I had thought that the castella was an egg roll, but after further reading I realised I was mistaken lol. I love egg rolls, but I’ll give the castella a try too! Reminds me how much I missed Japan. Interesting post. wow this looks amazing :)!